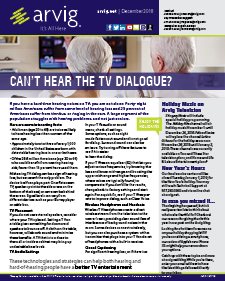 Arvig Newsletters | December 2018: Can't Hear the TV Dialogue? December 2018: Can’t Hear the TV Dialogue? Forty-eight million Americans suffer from some degree of hearing loss, which creates a challenge when it comes to hearing sound on the television. Luckily, there are ways to improve sound quality and create a more pleasant entertainment experience if you have hearing difficulties. Read the December newsletter for more.